We've spent the last two weeks talking about swarms. People spotting swarms of bees in their yards. Beekeepers wanting to prevent swarms in their hives. Other beekeepers trying to figure out what to do now that their hives have already swarmed. Here's what we hope is helpful advice for all of those situations! That's our best advice, no matter what the situation. Swarms are not dangerous nor are they a death sentence to a hive, so no matter what you've got going on it's going to be ok.
A swarm is a natural part of the life-cycle of a honeybee hive. When a colony begins to outgrow the space it is inhabiting, it will begin preparations for swarming. The old queen and a portion (up to about 50%) of the workers will leave the hive to form a new colony elsewhere. They leave behind a complete colony with a developing new queen. This new queen will go out and mate and the old colony will continue on. The stage of swarming that we usually see is when a cluster of bees is hanging out somewhere, like on a tree limb or a fence post, voting on where to go next. This cluster is often referred to as a "swarm" of bees, and is incredibly docile. These bees are not defending anything, so have no reason to sting. Bees typically stay in this cluster for 24-72 hours before moving on to their new residence. Again, remember our "don't panic" advice. Please call a local beekeeper to see if they can come and remove it. Many beekeepers will provide this service at no cost. We have a list of local beekeepers and the areas that they service right here. Remember that this is very different from a hive removal, or a cut out, which is much more complicated. This is a pretty cool way to get "freebees!" The process is pretty simple. Once you identify a swarm cluster, you simply need to put the bees into a box and move them to a suitable location. We say simply, but it's really only simple when the bees are located within easy reach. If they are, then it's usually just a matter of shaking the branch that they are on and knocking the bees off into a box. Once the queen is in the box, the bees will give you some good clues that she's there. Watch for "fanning," which is indicated by bees lined up at the entrances to the box, sticking their butts up into the air and furiously fanning their wings. They are spreading pheromones to call the rest of the bees to the queen's new location. Once this message is out, you will see the remaining bees move toward your box. When everyone is safely inside, it's fine to go ahead and move the box to another location. At this point, the bees can either be installed directly into a hive or left in a nuc box (always with frames!) until they are more established. You'll be watching for signs of a viable queen. In the unlikely event that there is no queen captured, you could purchase a new, mated queen and introduce her to the new colony. If your colony did indeed swarm, then there are a few things you will want to check on to make sure that nature has indeed taken it's course and the colony will be no worse for it. Remember that the old queen has left with the swarm, leaving behind a number of developing queen cells. These queens will begin hatching out and one (often the first) will become the new queen, disposing of the remaining ones. You will often see remnants of the queen cells upon your next hive inspection. If you do, then this likely means that a queen has hatched out and you will begin looking for signs of her presence in the hive. Once a new queen hatches out, she will go out on mating flights, returning to the hive fertile and ready to begin laying worker brood. It's not necessary to spot the queen, and it's often difficult to find a new queen because she isn't quite as large as she eventually will be. You'll want to look for proof that she's there. Eggs are the proof that we always look for in our hives. We look for single eggs in cells, as this is an indication of a healthy, fertile queen. Remember, it takes time for a new queen to begin laying and eggs are sometimes difficult to see. We get many reports from new beekeepers of queenless hives after a swarm, only to find a hive full of brood a week or two later. Nature works pretty well, and the vast majority of colonies do just fine at making a new queen. That said, it does happen that a queen is eaten up by a bird or something during her mating flights and never makes it home. In cases like this, the beekeeper will need to intervene and develop a plan to requeening the hive. This is a post that I'm incredibly irritated to have to write. Not because I don''t like bears, but because I'm not excited about the prospect of having to protect my bees from Winnie the Pooh. 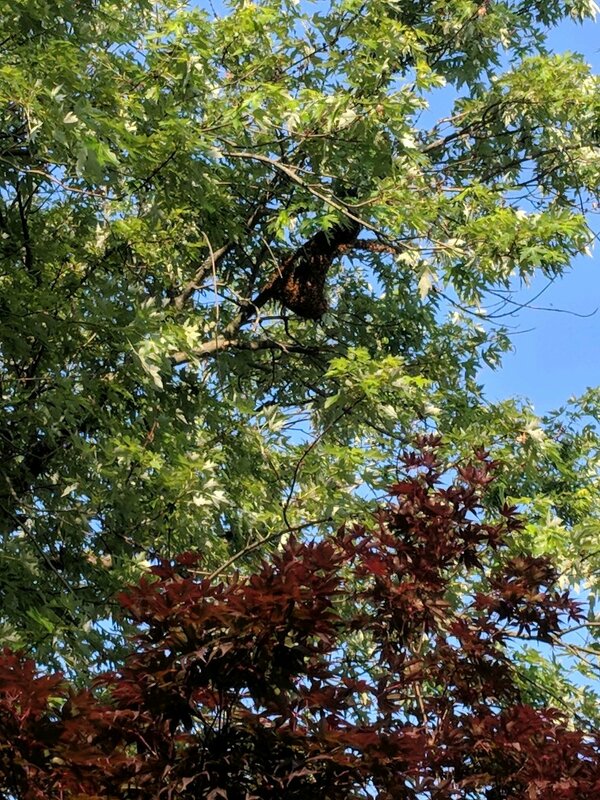 We typically don't have to deal with this issue here in the East Aurora area or in places north, but we've had numerous bear reports over the past few weeks...and we had a visit to our own apiary last week. Bears are largely harmless to us but can do real damage to an apiary. If you live in the Southern Tier, you've likely already thought about this and have protective measures in place. For those of us that haven't had it on our radar, here's some tips about protecting your hives from your neighborhood bear. Bears eat bees, particularly the larvae. In order to get at the treat they're looking for, they will typically knock over the hive and start removing frames. This causes a huge disruption to the colony, obviously, but can also destroy your equipment. Many times, a single visit from a bear can spell disaster for an apiary. Bears must be physically deterred from the hives, as there are no repellents that we are aware of. A physical barrier can be either structural or electrified. If you're handy, a bear-proof structure can be built to surround your hives. 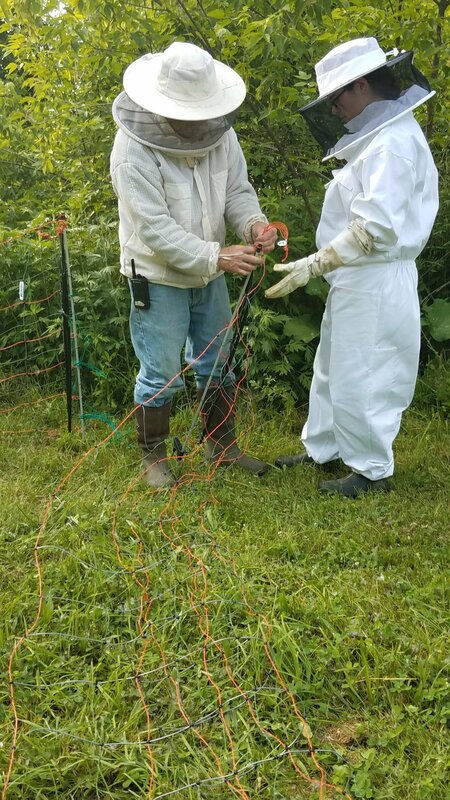 Our solution to the bear problem was to surround our hives with an electric fence. It took about an hour to set up, and was up and running the day after the "bear incident." Electrified bear fencing is different from horse or cattle fencing because it is comprised of a net-like fence. This is because a bear needs to feel the "zap" on his or her snout in order to encourage it to back away. A zap that hits the bear in the legs or shoulders will usually cause it to push forward, plowing through the fence and reaching your hives anyway. Electric fences consist of the fencing material and an energizer that will power it. These energizers can be either wired, battery operated, or solar powered, and are sized for the length of fence you need to electrify. We stock a variety of fencing solutions and can help you figure out what will work best for your apiary. We get to talk to a LOT of people about bees and beekeeping, so we thought it would be helpful to compile a list of the questions we get asked the most often. Wow! What a weekend! We want to extend a huge thank you to everyone who came out this weekend to celebrate the Fifth Annual Honey Harvest Festival with us! The festival is bigger and better every year, and we had a great time meeting new people and chatting about bees all weekend. A huge thank you to all of our volunteers who spent their time helping out with the event. Beekeepers are pretty great people, we've found, and we have an amazing network of folks in our area. Steve mastered the uncapping process with a smile. Kim got a workout as she extracted honey with the hand-crank. We are so grateful to the local vendors who joined us this year. Without them, the event wouldn't be nearly as much fun. This year awe had such a wonderful variety of folks here and we hope that you'll continue to support these local businesses. And finally...the results from everyone's favorite part of the event! Maria submitted sample #10, which received 21% of the votes cast throughout the weekend. Wondering about the other honeys? Here's the breakdown of where they came from and the percentage of votes each won. The actual cell count for that frame was 2,772, so Mika's guess of 2,750 was the closest! Congrats! 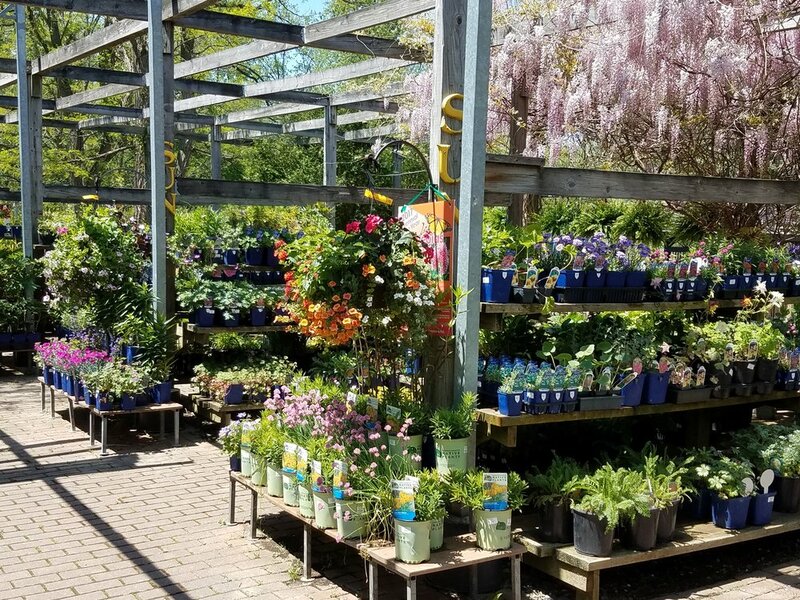 Last year, we updated our nursery yard to create a wildlife-friendly environment. Almost immediately, we saw toads move into the stream bed, bees and butterflies visiting the pollinator gardens, and so many species of birds visiting the feeders. It is such a peaceful place to visit! Bring your little ones in and go on a wildlife scavenger hunt together. Hopefully you'll feel inspired to invite nature back into your backyard! 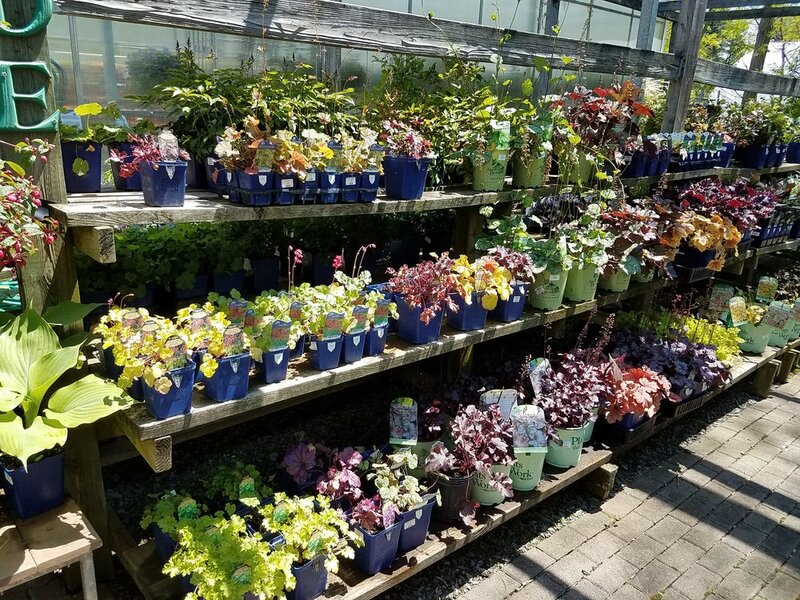 A walk through our annual and perennial departments is kinda magical right now. 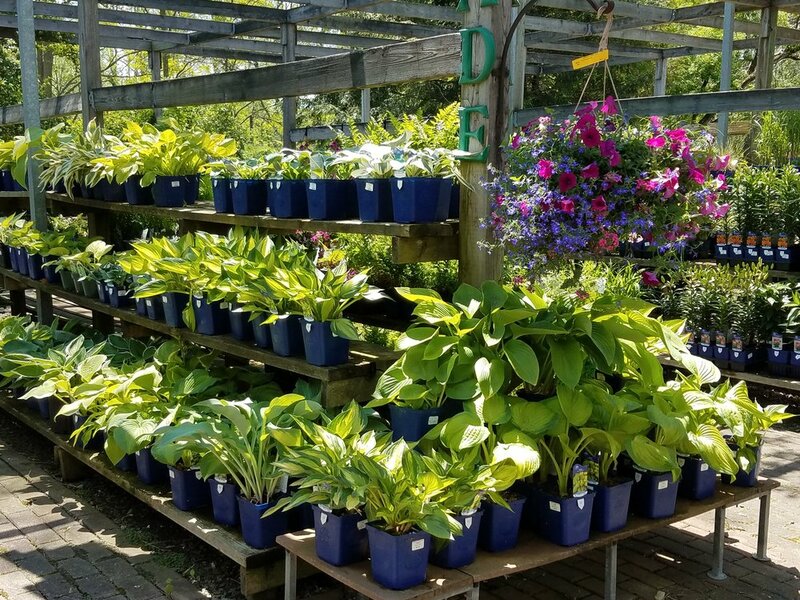 We are fully stocked with some of the most beautiful plant material we've ever had. The selection is awesome, and I feel inspired every time I turn a corner. Drop by and take a look, if only just to see the most gorgeous flowering wisteria on the planet! Nucs are on the way! The first round of nucs are finally on the truck and making their way to us. Looks like we're on schedule for our Saturday pick-up. 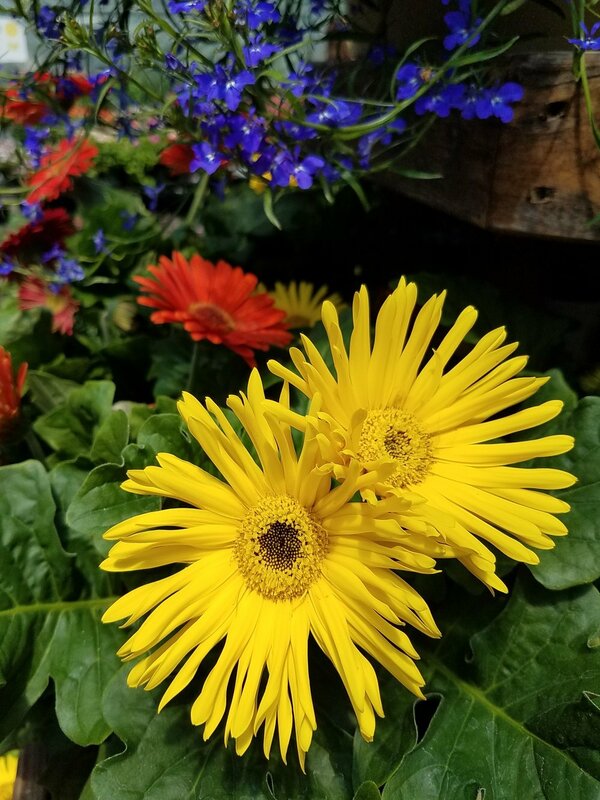 Plant some pops of color for the bees! A few weeks ago, our website was hacked, flagged, and then shut down by our server. We've been, inconveniently, offline since then. Rather than remaining angry about this disruption during what is a very busy time for us, we decided to look at the bright side and take this an opportunity to re-design our site and bring even better content to you. Please bear with us as we add more information back to the site, and don't hesitate to give us a call at the store if you have any questions at all. Also, a HUGE THANKS to everyone that came out to see us at the Plantasia show this weekend! We had a great time, and we're feeling excited for spring!